Feel and look better today! Wonderful healthy living is just round the corner. Lets us help you feel better today! 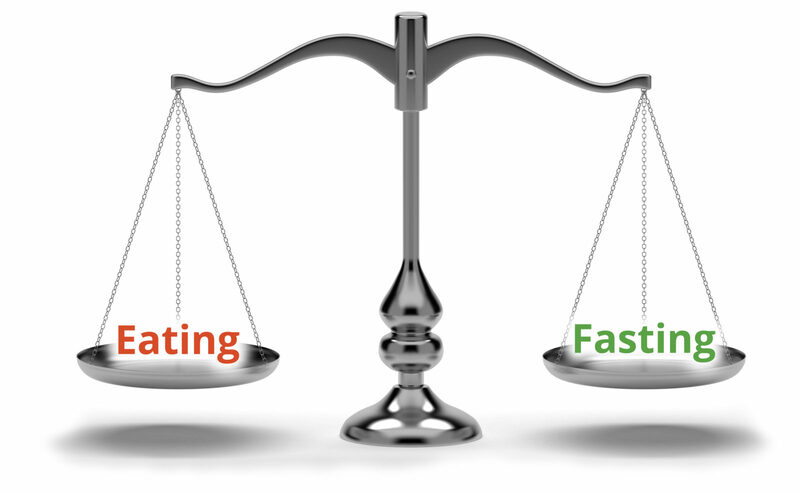 Intermittent Fasting Helps Weight Loss and General Health. Many of us eat five times a day or more, including meals and snacks. This type of eating pattern provides your body with a steady flow of nutrients, but even when you make healthful choices about your meals and snacks, your body can still benefit from an occasional break from all-day eating. Every time you eat, your body digests the foods you consume, then absorbs and transports nutrients to all of your body’s cells through the blood stream. Your cells can either use these nutrients right away or store them for later. When you consume more food than your body needs at any one time, it can lead to a back-up of excess nutrients for your metabolism to manage. When additional nutrients arrive in the blood stream from your next meal or snack, they take priority over nutrients that have already been stored for later. If you never give your body a break from all-day eating, it can lead to problems for your metabolism and result in weight gain, over time (1, 2). Your body might have a hard time clearing up any excess nutrients that have been placed in storage, especially when you consume more than your body can use. Some processes within your cells are put on hold while your body is managing a continual flow of nutrients from frequent meals and snacks. One of these processes, called “autophagy,” can be thought of as your cells’ own internal cleansing process. When the flow of incoming nutrients begins to slow, the process of autophagy becomes activated. Old, worn-out, or obsolete components within your cells are tagged for disposal and broken down to their component parts. This process cleans up the parts that your cells can’t use anymore and converts them into basic building blocks like amino acids to support cell maintenance and growth. Taking a periodic break from eating allows the process of autophagy to be activated naturally. New discoveries related to the central role of autophagy within cells led to the 2016 Nobel Prize in Physiology or Medicine, which was awarded to Dr. Yoshinori Ohsumi “for his discoveries of mechanisms for autophagy” (3). Continuing research in this area has shown that as a part of normal metabolism, autophagy helps to support the health of the heart and the brain (4, 5). As a process of cellular cleansing and renewal, autophagy is essential to the long-term maintenance of good health (6). By taking a short break from eating regular meals on Cleanse Days, you put the constant flow of nutrients on pause and allow your body to use up excess stored nutrients. This aspect of Cleanse Days can contribute to helping you reach and maintain a healthy weight. Fasting on Cleanse Days is also a way to support your body’s own cleansing and renewal systems since the process of autophagy is naturally stimulated by fasting. New research continues to explore the influence that occasionally giving yourself a break from eating, also known as intermittent fasting, can have on health. The potential metabolic changes that occur on Cleanse Days suggest that this approach can offer benefits for anyone, whether your goal is to reach a healthy weight or simply promote long-term well-being. Is The BMI what is used to be?